2018, Fairport’s 30th year in business, has been a very mixed year for our clients, some of them in drought, others having bumper years and a mixture in between. Let us hope 2019 will be a more prosperous year for everyone. We here at Fairport are looking forward to 2019 with quite a few things already on the go and new clients continuing to come on board. We especially like to welcome back our clients that return to PAM after being “forced” by their Agronomist to use some other product only to find it frustrating and not as robust for their management and analysis requirements. Don’t forget we have PAM FieldREX which is a free mobile app, designed especially for consultants to use with your PAM. It uses the Fairport Data Exchange, so they can get your data via the internet no matter where they are. As in Pocket PAM they have access to all your paddock/crop history for the year. Further to that, they (or anyone else you nominate) can access your reports & up to date information using PAMShare.com. If you need more information on these options, call us in 2019. The ongoing development of our new flagship product “agCommander” is moving forward rapidly. After many months (years really) of important background work in the database design as well as other critical backend processes built to optimize the user experience and facilitate our current and future client’s farm management needs, we can now see it all coming together. Using our many years of experience to streamline data entry the new interface is truly our best work yet. We have started the first round of in house testing and fine tuning. It is very evident that we have gone the extra mile to emphasize how simple and easy it is to use agCommander as a powerful tool. There is still plenty of ongoing testing to do before we move onto the next stage but we are very happy and excited with the progress being made so far. Cropped Areas and Seed Used report -Now includes Associated Crops so if you have a mixed fodder crop or under-sowing or a pasture seed mix, all crops are included in the report. Work Orders report options have been enhanced – You have more choices as to what is included on the printed version of Work Orders. Chemical QA reports – Speed of producing this report has significantly increased. This had been an issue in some horticultural operations. Added a Browse View for Livestock Splits & Joins - to make it easier to see where mobs have changed. Colin went to Papua New Guinea to train the staff at Trukai, a new PAM Enterprise client who has a rice and livestock operation near Lae. They were all very enthusiastic about implementing PAM into their business process and could easily see how it will help to improve their management systems. We achieved a great deal over the days of training and it was pleasing to see new happy PAM clients and to see how well it will fulfill their needs. Mind My Assets has been getting more users throughout 2018 and has also had quite a few enhancements added at the request of users. Mind My Assets is now managing a total of 23190 assets. We have recently imported a client’s machinery list from PAM into Mind My Assets … so the option for us to import your Machinery List from PAM into Mind My Assets exists now to save you time setting the system up. If you haven’t had a look at it yet or know someone that could use it go to www.mindmyassets.com and sign up for a free 30 day trail. Christmas Break – We will be closing on Friday 21st December and resuming work on Wednesday 2nd January. Colin will be monitoring the Registration emails (not faxes). If there is any URGENT support required you can call Colin on 0413050739. Welcome especially to all our new clients who have joined us in 2017! We would like to wish you all a very safe and happy Christmas and a successful 2018. Thanks for choosing Fairport. We'll do our best to help you with your business management. * HAVE YOU LOOKED AT "MINDMYASSETS"
Next year will mark the 30th year since the first line of source code was created in the very first PAM program. That version 1.0 was released in August 1989 and some the clients who purchased that version are still our clients today ... well, in many cases it's the next generation! We quite often say after hanging up the phone from a support call ... "I remember when he was just a little schoolboy" ... or even "when he was just a glint in his father's eye". Yes, it's been a long journey and we sincerely appreciate the support everyone has given us for all or part of this journey. We've had some personnel movements here in recent times. Ben, who joined me in 1998 (19 years back) as a relatively young man, left us in October. Ben arrived to form part of the development team that built the first PAM for Windows (PAM 2000+) has been responsible for an enormous amount of work over those 19 years. His focus was primarily on the cropping section of PAM. We wish him all the best in his post-Fairport ventures. Suzanne left us at the end of last week to work for her partner's business. We wish her well. Suzanne was with us for 3 years as our office administrator, receptionist and accounts person. We will be actively searching for a replacement for her in the new year. If you know of anyone who lives in the Perth metro area who might be interested in this role, we'd love to hear from you or them. Manuel, our IT support specialist left us in October for a role with the Commonwealth Government in Canberra. Manuel was with us for 5 years. We welcomed Dalton to the office while Manuel still had 2 weeks left of his notice period to complete, so it was great that he could pass on as much of his Fairport in-house knowledge as possible. Dalton is a young and enthusiastic guy who lives quite close to the office. He has 2 IT Certificates from TAFE and is now working on an online degree with RMIT in Melbourne. We welcome Sai Patibandla who came to us from India via Brisbane. Sai graduated with a Masters degree from Queensland about 8 years ago and prior to joining us worked outsourced for a US-based web application developer. We also welcome two very experienced web application developers to our outsourced workforce. One is based in Sydney and the other in Germany. Apart from developing MindMyAssets earlier this year, we have begun work on two (new and large) web projects. In October we developed a web and mobile application for one of our large and esteemed horticulture clients from Bundaberg in Qld. That application is used to monitor certain attributes of avocado trees. Each tree is tagged with an RFID tag which can be read (and written) using an Android device and read by later model iPhones. Both mindMyAssets web and mobile applications have recently gone through a major reworking, making them faster and improving the workflow. Some clients now have a lot of data entered, and the feedback was telling us that some improvement where needed. So, the old and new guys here have been, and are still, very busy! PAM developments are shown further down in this newsletter. In addition to those, we have been talking with clients in New Zealand about exporting relevant records to the large kiwifruit acquirer, Zespri. That is an ongoing discussion. We will let you know when that evolves further. While in NZ, a while ago we developed a data export capability for the NZ Sustainable Wine Growers organisation. Please pass this information on to anyone you know is looking for a viticultural management program with an interface to the NZSWG. Importing harvest deliveries from Graincorp is also now on our radar. Discussions have been underway with their IT department in recent weeks. As mentioned in previous newsletters, if any clients are in need of some training to fill some knowledge gaps we have over 80 "Getting Started" videos on our website. To find them, click on the "Support" link on the main menu. If you would like even more help than those videos provide, call us and we can arrange one-on-one training with your data, on your computer, over the internet using Team Viewer. Wasn't it great that the Aussie cricket team regained the Ashes here in Perth this week! Here's hoping for a 5-0 whitewash! Also great news for sheep farmers these days with the sheep meat prices and wool prices where they are. Great reward for those of you staying with sheep. So that's it for me for this year. I hope you all have a safe and happy Christmas and a wonderful and prosperous 2018. Have you had a look at Mind My Assets yet? We have had a good uptake of the MAX replacement called Mind My Assets. The feedback from users has been very useful as has helped us fine tune and streamline the data input on both the Web version as welll as the Mobile App. Keeping track of your machinery, vehicles, stationary motors, boats, motorbikes, windmills, pumps, whatever-you-have ... maintenance schedules, parts lists, serial & vehicle numbers, suppliers, alternate part numbers, running costs... overheads. That's what MindMyAssets is all about. It is all about helping you get organised and helping you to keep on top of the important business of keeping your valuable assets maintained. The evolution of PAM started in 1988 ... and it never stops! * QA Report (GAP Report) - Re-Entry Interval Report, changed the default report from "applications in the last 48 hours" to "all applications within the REI period" PAM gives a list of only blocks that are still withing restriction. * The Save routines have been reworked to speed up the process. This is especially helpful in Horticulture where many Blocks are treated at the same time with a mix of Chemicals and Fertilisers. * Management Group Reports - Totals have been enhanced to provide better Income & Expense figures and Gross Margin details. * Map Reports - Soil Test depth has been added to allow the reports to show the results separately for each test depth. * Work Order Report - has been enhanced to allow selections for including Active Ingredients, hiding the Batch Number and hiding the Sprayer Details. The report has been slightly re-formatted to improve the layout of the page. * Pocket PAM2 Listener - Fairport Data Exchange has been re-written to speed up the uploading of data from PAM to FDE and PAMShare. * Sprayer Calibration Record - The report has been improved to show Flow Meter Reading correctly. * Daily Paddock DSE Stocking Rate - A new browse report to show the DSE Stocking rate on a daily basis for each paddock for a month has been added to the report menu in te Livestock Diary. While a lot of our clients are burning diesel sowing their winter crops, we have a chance to catch up on some jobs that have been put to one side during the busy first quarter of the year. The year to date has been as busy as ever here and sales have been better this year than the last few. I put that down to the fact that last year was a particularly good season for a lot of Australia. Unfortunately, people in Queensland and Northern Territory are still in the grips of drought. Our best wishes go out to you if you're caught up in that. It's been a tough ride for you folks for a long time. The most significant change for us has been the release of MindMyAssets on April 6th. This is a cloud and mobile application set that is designed to replace MAX. We will migrate MAX data to MindMyAssets for anyone who would like to move their historical records to the new platform. While some of us have been busy with MindMyAssets, the work never stops on PAM. Read more about that later in the newsletter. Overseas interest in PAM & PocketPAM continues. Enquiries come in constantly from countries where we have active distributors and elsewhere. Late last year I traveled to Azerbaijan where our man in the Caucasus region, Simon Appleby, is always busy on one scheme or another to get our products into that region. Jim Geltch, International CEO of Nuffield, recently appointed Simon as the Nuffield Scholarship representative in the Caucasus. We wish him well with that endeavour. We are still working with Saudi Arabia's biggest mixed cropping company, hoping to get some traction with that deal in the next few months. If any clients are in need of some training to fill some knowledge gaps we have over 80 "Getting Started" videos on our website. To find them, click on the "Support" link on the main menu. If you would like even more help than those videos provide, call us and we can arrange one-on-one training with your data, on your computer, over the internet using Team Viewer. Let's hope the rest of 2017 works out well for everyone. Food Crop QA Report - Batch Numbers have been added. This form has been updated so it can be emailed directly from PAM or saved as a PDF for emailing, rather than having to print it to complete and then scan or fax it. Contract, Seed Supplier and Prepared by are pre-filled in the selection screen and included in the report. Farm Filter is now active in Budget reports - The Farm Filter now works in the budget section of PAM so you can now do budget reports for one or more farms in the budget. This was requested by clients that were share farming so they could report the cropping detail and consumable requirements for the farm owner. Quality Assurance Reports - Chemical Application Record Sheet – This report was sped up so now it appears in seconds rather than minutes. Inventory SOH by Chemical Type Report – This has been added to group chemicals by type (Herbicide, Insecticide, etc. ), You can also select which groups you want to include in the report. Inventory Reconciliation Report – This report has been added to allow clients to produce a reconciliation report with Opening SOH & Value, quantities in and out, and Closing SOH & Value. Budget Summary report has Growth stages added – This report was added to allow users to produce a working sheet for operators with all operations on a paddock for the season. The report requires the Hide Financials to be ticked in order to show the growth stages. The idea is to have growth stages set up for Pre-Planting, Planting, Post Planting and so on. IAR Trait Browser – This has been enhanced to allow lifetime traits to be used in calculated fields, i.e. Introduction Date, Birth Weight when calculating a value for a report. Feedlot - Gross Margin Report for IAR Module – This has been created to allow a Gross Margin to be calculated on each animal in a feedlot from the introduction date until it is sold. It can also be run while the animal is still in the feedlot so you can get a break even cost. Browse View – Staff & Contractor Work records (All Cropping Tasks) – This was done up to include the cost per unit and number of Items, so in addition to Hours & $ the users can see how many units were in the Labour Record, e.g. number of Bins picked. This will be very useful for vineyards and horticulture. Cropping Reports – A Farm Filter has been added to these selection screens. This is the same as the main Farm Filter. It was added to these reports so users can run a report based on crop types and varieties across selected farms without having to exit the report selection screen, changing the Farm Filter and loading the report again. Livestock Mating Report – added Due Date to the report. Crop Monitoring – Added the ability to be able to Multi Select crops when doing Crop Monitoring or Pest & Disease or Weed Monitoring. MindMyAssets replaces MAX! Many MAX users have contacted us over the past few years asking when or if we would be enhancing it. MAX started out in 1991 and has found a place in many workshops around Australia .. from farmers to tour coach operators to small truck fleet operators to crane hire operators to municipal councils. We're very pleased to be able to keep the concept "alive" with Mind My Assets. As we wind up for 2016 we would like to thank all our valued clients, agents, distributors and technology partners here in Australia and in many countries around the world for all the support and assistance you have given us during the year. We hope you have had a good year this year. Most of the broad-acre cropping clients are very happy with the 2016 season; we hope that our livestock, vegetable, grape, fruit and tree clients have had a good year too. There have been many small improvements in PAM over the last 12 months; many of them have been behind the scenes speeding up the software. PAM is now 28.5 years old and thanks to the help of all your feedback over all those years is packed full of features, so ‘ground breaking’ enhancements are rare. PocketPAM2 was released in April this year & was extremely well received. The feedback on the “user experience” improvements and the new features compared to the first generation of the app was very encouraging. We are looking forward to 2017 as we have several large installations to do overseas as well as in Australia. PAM development is ongoing and we are going to be moving onto designing the next generation of the software. As we wind up for end of the 2015/16 financial year we would like to thank all our valued clients, agents, distributors and technology partners here in Australia and around the world for all the support and assistance you have given us during the year. The main focus here at Fairport HQ over the past 6 months has been finally getting PocketPAM2.2 released. In all this upgrade took around 6 man years of effort! We have been told by many that it is a big improvement over the PocketPAM2 version. Thanks for feedback! Here in Western Australia the season so far has been very kind. Some have even said it is the best they can remember. It is good to see that the drought affected areas in Queensland have had some good rains recently. Good luck to all for great finish to the season. In the past 2 months I have been away from the office a couple of times. I was in the US on business for a week and also in Queensland for a few days in May. 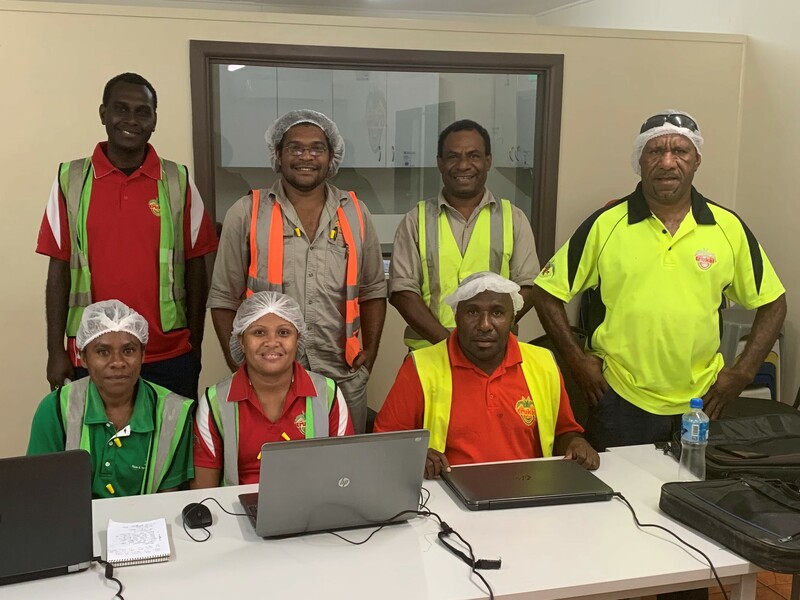 I was in Ayr doing a day's training with the Sugar Research Australia farm managers and then two days in the Bundaberg area at Hinkler Park's macadamia operation and at Austchilli's chilli and avocado operation. It was great to get out to see PAM in action on these very busy operations. Colin arrived back from a 5 week trip to the US in early June. He and a group of his mates and their partners toured the south east area of the country on motorbikes covering almost 6000 miles. PAM enhancement and maintenance never stops... Apart from adding the features being requested on an ongoing basis, there is ongoing work to speed up the adding and reviewing of data in all areas in PAM. A "Diary" view in the Budget system. This enables you to view all your budgeted events bulked together and ordered by date - as per the Paddock Activities Diary. Latitude & Longitude columns were included in the Browse View of Crop Monitoring data. This enables you to upload the coordinates to a GPS unit .. and also to enable you to create heat maps (images) of pest or disease or weed infestations in the PDP module. A new "Planting Name" concept added mainly for market garden type operations where many more than one crop of a given type is planted in the one block per year. There is also an option under "Customise Your PAM.." to make Planting Names mandatory at data entry time. Speeding up the display of records in the Paddock Activities Diary screen. Speeding up the deleting of job records in the Paddock Activities Diary screen. Job Photos: Currenty photos associated with a job are not sent to PAM. This is about to change. We have developed around 90% of the end to end functionality to get this working and expect to be able to release it within a week. A new PAM version will be needed as well as the PocketPAM upgrade that you will receive via the app stores. PocketPAM users will receive an email when that happens with full instructions. Precision Crop Technology Imagery: Growers using PCT services will be able to view their yield, EM, Slope .. etc. images overlaying their paddocks in the PocketPAM Mapping Module. Season Greetings from the Fairport Team! The Fairport team and I extend our thanks to all our clients for your ongoing support. We also extend a warm welcome to all new clients joining us in 2014. Another year comes to an end. I hope you are all able to take some well earned rest over the festive season and enjoy the company of your family and friends. We will be closing down the office from Midday on December 24th and returning on Monday the 5th of January 2015. The Fairport team has been very busy as usual this year. Three months ago we welcomed our newest member of staff, Jacob, who has fitted in nicely. Travel-wise it has been quieter than usual since the mid-year newsletter. Colin has made several trips to Eastern Australia on presentations and training missions. The second half of the year became quite active for new PAM Enterprise clients. Many companies that had been showing interest in it for several years made the decision to jump onboard. My two trips to Saudi Arabia in April and June are bearing fruit. Early in 2015 a delegation from Saudi Arabia will be traveling to Australia to visit some of our clients who are running PAM Enterprise and PocketPAM systems. We also have plenty of action happening in Ukraine, despite the war, as our man in Kiev, "Bo", continues to make great progress with the larger grain growers in that region. In fact, this week he has been in Stavropol, Russia, training PAM clients. – designed mainly for consultants to create VRT projects for clients. This is downloadable from the main "PDP" page of the web site. PDP Lite provides an importer for the common SHP file type and then a comprehensive variable rate application recipe map builder. The resulting recipe map can be exported to a number of different variable rate controller types. PAM's New Zealand Sustainable Wine Growers data exporter. A team here worked on this project for several months. It is now built into the PAM viticulture software and becomes enabled when you choose "New Zealand" as your country. We receive many calls these days from people asking if PAM will run on a "Mac" ... The answer is Yes. In fact I run a Macbook Pro and so does Colin. in my case I run software called "Parallels" which enables me to run both Windows software and Mac software side by side. In Colin's case, he runs permanently in Windows on his Mac. That is, he doesn't run any Apple software, boots up in Windows and stays in Windows. To do that, he uses software called "Bootcamp". PAM SaaS - Convenience ! PAM SaaS, our "hosted" PAM system that was launched in 2003 (yes 11 years ago), continues to attract more and more clients for its convenience. Earlier this year, the growing number of client databases forced us to move the PAM SaaS system from our premises to a data centre located near the Perth CBD. If you are running a Mac computer then this is another way to run PAM. PAM SaaS will run in a Mac without the need for either "Parallels" or "Bootcamp". Fairport takes care of all software upgrades on PAM SaaS. Meaning - No more do you need to download & install PAM software ! Does PocketPAM2 work with PAM SaaS? We have a team here and offshore working on a complete rebuild of the PocketPAM2 App from the floor up to catch up with the changes in technologies since we released PocketPAM2 around 2 years ago. We expect to finished the development work on this early next year and then proceed to final testing. There are a lot of very nice new features coming in this upgrade. Stay tuned. Our new man, Jacob has been building a new version of gpMapper from the ground up. This is a complete rebuild. The program looks (and feels) completely different to the old gpMapper and is based on the very latest technology. We are very excited about this new product. We think our current gpMapper clients will love it. The rest of the team is working on some major new projects that we hope to bring online during 2015. It's too early to announce these yet, but you can rest assured that we will be letting you know as soon as we're getting close to making them available. The Fairport Team wishes all our valued clients the very best for the festive season and for 2015. May the new year bring great luck and prosperity to you all. I hope the season is treating you well. Welcome to all our new clients. Here at Fairport HQ, we have had one of the most productive first quarters to a year for a long time. For many years we have been wanting to create help videos to help our PAM and Mapping clients with getting to know the software and its many features. Finally we have made a start on this process and the number of videos on our web site support pages is approaching 100. PAMShare - See below. Is this the "Perfect World?" ... producers can record all the daily events in PocketPAM2 as they go about their daily business. Consultants can record recommendations and crop monitoring recrords in FieldRex ... and to tie it all together PAM generates reports and "posts" them up to the PAMShare web site for everyone to keep track of all cropping and livestock activities. New dealers: We welcomed new dealerships to our world this quarter: In China, Ukraine & Georgia. Welcome & thank you for coming on board, Yolanda, Bachana & Simon. Currrently Simon is having PocketPAM2 re-transalted into Georgian and Yolanda has completed the transaltion of PAM into Chinese. She completed the Chinese translation of PocketPAM2 earlier in the year. InfoPest - With InfoPest (the chemical database of all registered chemicals in Australia) changing hands from the Queensland Government to Growcom a year or two ago, we lost the ability to import the data from their DVDs into PAM. Growcom made a decision to end the DVD subscription business model and move to a free on-line subscription model. Well ... the good news is we've developed a new importer for InfoPest data than can accessed freely from the web site ... See below. PDP Lite - This will be a light weight program used to create Variable Rate projects for a multitude of different controllers. Mikhail, now based back in Russia, has been working on this project for the past three months and it is very close to being released. Aimed primarily at consultants wanting to produe variable rate maps for clients, but it will be suitable for all of you wanting to do Variable Rate application work. Colin recently returned from a week in the "East" where he spent time with Paul Drendel, our man in Victoria, presenting a training and 'catchup' seminar to many clients. He also did some presentations to prospevtive clients. The Fairport Data Exchange has been given a new role ... it can now upload special PAM reports to the new PAMShare website: www.pamshare.com ... Rather than describe how this works and what its for, please visit www.pamshare.com.au and read all about it there. A few clients have already started using it and are finding it to be a great concept. Over the past three months we have created lots of PAM and Mapping help videos. This number will grow over time. The plan is to cover all areas of the software and fully replace the manuals and contextual help. So ... if you are just starting out with PAM or Mapping or have a need for some in-depth in-house training on any area, please check out the list of videos on this page. FieldRex has had a major update. Agronomists and in fact anyone running PocketPAM or FieldRex can now record Crop Monitoring records across multiple cropped areas. A special request from our friends growing Kiwifruit, in New Zealand. This will enable you to record something like : A nutrient deficiency across all Wheat crops in one pass. Since the beginning of 2013, there have been a total of 42 enhancements made in PocketPAM2. They include a number of useful reports that PAM transfers to the device. With the exception of a few of them, they have all been at the request of the users. Thanks for the feedback. In recent weeks we have fully revamped the Time Keeper module. This module is designed for producers running teams of workers performing manual tasks. Typically in horticulture. A full rewrite of the program is underway to move it into the latest version of the development tools. These tools have come a long way in a short time, so we are hoping for some major performance improvements when we finally release the rewritten version. PAM development never stops. Probably our biggest enhancement so far is the new InfoPest data importer. InfoPest is an extremely comprehensive chemical database of all registered chemicals in Australia. The database was originally maintained by the Queensland Department of Agriculture (DEEDI). Unfortunately, they had funding reductions and had to abandon the service. Many years ago we built a data importer for InfoPest data in PAM. The data was copied from the DVD or CD that subscribers would receive quarterly. The even better news for growers is that there is absolutely no charge for subscribing to the web site. Once on the web site you can search for any chemical, view all the data relating to that chemical and also download the data. Now, even better news still for PAM users... we have built an importer into PAM8 (version 8.5.4 and later) that will import the data that you download from the InfoPest site. This data imports into the PAM Chemical database just as before. Once there, you are able to use that list as your master list when you want to add new chemicals to your PAM chemical list. We also import all the active ingredients and much of the other relevant data. We also provide a convenient link to the InfoPest & AVMPA websites, directly from PAM. We will publish a video on how this works very soon. PAM users will be notified. Assigning the events and their costs to a crop. As you will know, when recording a planting events (or seeding event) in PAM, PAM will ask you if you want to allocate any jobs that you recorded earlier, to the crop. In addition there was an option from the Tools menu in the Paddock - Season view that enabled you to perform that allocation task as an afterthought. We removed the option as it was causing some undesired effects under some circumstances. Well, the good new is, in the past few months, we have introduced a new way to quickly assign all those jobs to a cropped area. Look for the option on the "Tools" menu in the Paddock-Season View: "Assign Paddock or Un-Cropped jobs to a Cropped Area" ... this option enables you to assign all paddock events to a crop. Year number 25 for Fairport has come to an end. Thanks to all our clients, new and old for making it a great success. From where we sit we hear about the fortunes and disasters of farming. While parts of the Australia have just experienced possibly the best year in memory, others are suffering drought and possibly the lowest rainfall ever recorded for a year. That's farming I guess. At the end of this year we bid farewell to Mikhail Beloshapkin who is returning to Russia to live after six and a half years with us here in Western Australia. Mikhail has been responsible for all the development work in the PDP (Precision Data Processor) software and the development of the data transfer technologies behind the PocketPAM2 system. We expect that Mikhail will continue working with us in some capacity when he gets back to Novosibirsk. A few weeks ago Saeid Pahlevan joined our development team. Saeid is Iranian by birth but has been in Australia for nine years. He has degrees in Mathematics and GIS Photogrammetry and Surveying. His past experiences include 11 years developing specialised mapping systems for the Iranian government, several years working as a developer behind the scenes of the internet service provider Westnet here in Perth, some time with NGIS, a Perth based GIS software developer, several years with the WA Department of Environment, again developing mapping software (web-based) before a 2 year stint with Micromine, a developer of 3D software systems for the mining industry. Saeid has been thrown in at the 'deep end' here with (initially) taking over development of the PocketPAM2 and FDE data transfer technologies from Mikhail. Colin Booth enjoyed a 6 week break in the US during August-September. He and his wife traversed 7 US states on a Harley Davidson covering 7,000 mile in total. He said it was a great experience and is looking forward to doing it again (covering different states) in 2015. Manuel Silva Castillo took a few weeks off to fly back to visit his parents and friends in Columbia during the past few months. We were invited to send someone to Ayr in Far North Queensland during October to run a 2 day training event for members of the Sugar Research Australia team in the Burdekin area. I went for the trip and enjoyed meeting some of our clients from that area and a room full of extension officers from various research and advisory organizations. The trip was well worth the time and we look forward to seeing some renewed enthusiasm from the people in that part of the world in 2014. In early November, I flew to Russia for a week. On the Monday I was in Moscow to meet with Tony Stamford (our man in Moscow) to check on his 'irons in the fire' in that part of the world. It is quite amazing what is happening in the former Soviet Union. That night I traveled to Bryansk (SW of Moscow, 6 hours by train) to visit a team of people who operate a formidable farming operation in that area for the Tuesday and Wednesday. In the past 2 years they've developed 33 cattle farms, all with state-of-the-art cattle handling systems, which will, when in full swing, be running around 4000 Angus breeders each. They have kicked it off by importing 20,000 heifers from Australia and 80,000 from the US. They are also in the process of setting up a chicken meat business (a series of chicken sheds, from breeders to growers) that will be producing 100,000 tonnes of chicken meat per year and a 45,000 head cattle feedlot. All quite amazing. They are also building their own slaughter houses for both the chicken and beef operations: the beef slaughter house to cater for 450,000 head/year, chicken: the 100,000 tonnes. They also have their own feed mill (to produce 300,000 T/year ... to feed the chickens) and are well advanced with building their own (4 story) offices near the slaughter houses. When in full swing they expect to be employing 19,000 people across their whole business! And ... in case that isn't enough, they already have Russia's largest pig operation which is located in another part of the country. Then back to Moscow and then to Stavropol for Thursday and Friday morning (2 hours flight south of Moscow) to visit our clients (Irrico) who have been very busy acquiring as much excellent cropping land in that area as fast as the system allows. It seems "red tape" gets in the way of rapid progress. They are aiming for a total operation of around 50,000 Ha. of which 40,000 Ha will be irrigated by centre pivots. I understand their first harvest (just completed during their last summer) was from around 20,000 Ha, of which 15,000 Ha was irrigated. I didn't get to the farm unfortunately, it is located an hour or two from the city, but spent time in their head office and had a chance to meet the senior farming and accounting staff, face to face. After another day of meetings in Moscow (with the Vice President of our newly appointed Ukraine agents, based in Kiev) it was time to head back home. In late November I flew to China to run a 2 day training session for a client who happens to operate China's largest wine grape vineyard operation. This company is an offshoot of the company that manufactures HTC mobile phones and ViaTech computer motherboards and chips. The CEO of the wine business also sits on the board of HTC. He got excited about PocketPAM2 when I showed him. I guess with HTC operating on an Android operating system... he could see HTC sales in it! The wine/vineyard business occupies a floor of the ViaTech building which is on the outskirts of Beijing in a technology park (right next door to Google's main China office). They already have 2 wineries and are in the process of building up the area under vines to 1000 Ha. They also operate an extensive vine nursery operation. I was very impressed at how well the vineyard team had been running PAM over the past year and their depth of knowledge. It was obvious that all the trainees had dedicated a lot of time in studying the workings of PAM. As a result the training they needed was at an advanced level. The trip was well worth the effort. I learnt a lot about the subtleties of growing grapes in China and they were very appreciative of the the advanced training. In early December I attended a conference on Plantation Management in Kuala Lumpur at which we were a sponsor. The purpose was to learn more about best management practices in the plantation sector and to meet with some of the major players in that market. It was good to meet with some of our existing clients from Laos and to talk with the leaders in the field of guiding plantation owners in best management practice and sustainability. This market sector (particularly the Oil Palm sector) is booming but has considerable challenges in dealing with criticism from environmentalists and other lobby groups. Having done all of those trips in quite a short time, it is good to be back in the office and back to normal living again. We mentioned the development of the "FDE" in the last newsletter. Shortly after that we went live with this technology. People are now using the FDE to transfer their PocketPAM2 and PAM-FieldRex data to and from their PAM software. FieldRex was released and went "live" at the same time as the FDE. To get a good understanding of how FieldRex works and how your consultants can seamlessly transfer recommendations to your PAM (and PocketPAM2), please visit the dedicated web page. Since the beginning of 2013, there have been a total of 30 enhancements made in PocketPAM2. They include a number of useful reports that PAM transfers to the device. With the exception of a few of them, they have all been at the request of the users. Thanks for the feedback. During October we added a new module: the Inventory of Harvested Produce. This new module operates in the same way as the same module in PAM and includes support for the new PAM, Grain Contracts system as well. We are very encouraged by the number of clients who have taken up PocketPAM2. Thank You! The number of licenses "out there" has gone well past 500 and on the way to 1000. Obvioulsy it's helping our PAM clients in their efforts to capture more and more data in the field. The more and better the data, the better PAM will work for you. One of our long-standing clients made a point the other day that thanks to PocketPAM2, he is "finally getting all the benefits from PAM that I always wanted ... and I'm hardly ever sitting at the computer!" Harvested Produce Contracts: During October we added a new module in PAM that enables you to add grain contracts and record deliveries that fill those contracts. To get a full understanding of how this works, a help file can be downloaded from our web site. Fairport Club members: Look for it under the "Data Entry" section of the Support Files web page . Cultivar Mixes: This new feature is specially designed for those of you who plant seed mixes of pasture seeds. It enables you to give the mix a name and to define the mix in terms of a set of cultivars. The option can be switched on via the "Cropping" tab under "Customise your PAM program..."
Livestock Activities Diary: this screen has had a 'behind-the-scenes' overhaul to improve its speed of display. Individual Animal Records: Export to XML File - this feature was added with exporting to Sheep Genetics in mind. The export file created by PAM will be compatible with their requirements. Food Crop QA Report: This report has had a layout overhaul. You can get at this report via the QA Reports menu in PAM. Search for Planned Jobs - If you check the options on the Tools menu in the Paddock Activities Dairy, there is new option that will switch on the Plan number search feature. This will enable you to rapidly locate a job by it's Plan Number in the Paddock Diary. PDP - Precision Data Processor Recent work done on the PD software included a revamp and some fixing of some of the variable rate outputs. The PAM Share web site will work on any sized screen - iPhone, Android, iPad etc. Firstly, from within PAM, you nominate that you want to use PAM Share. PAM then prepares certain reports and uploads them to your dedicated area on the PAM Share web site at the time intervals you nominate. You nominate who are you are prepared to allow to visit your dedicated area on the PAM Share web site - and also if the guests are entitles to view your financial reports. Various livestock reports including: Stocked Paddocks, Category-Mob numbers, Empty Paddocks. ... and we expect as time goes by, you will be asking for more features .. and we'll be happy to hear from you. Our Chinese clients in Beijing were very excited about using PocketPAM2 ... and in the past week a member of their staff has translated PocketPAM2 into Chinese! We'll be releasing this version soon. Meanwhile translation into Chinese of the PAM program is also going ahead as this newsletter goes to air. We have been told by many that the VRT (Variable Rate Technology) recipe builder in PDP is the best out there. We have also been told there is a need for a light weight application that can take files from other software that are ready for converting into variable rate recipe files for (potentially) a number of different controllers. The end result of this will mean that the one recipe file can be sent to different controller types. This will be especially useful when you change to a new brand of controller and want to use your old recipe maps. Work on this application is under way and we hope to release it within the first quarter of 2014. PAM version 1.0 was actually released in August 1989, however the first strike of the keyboard in the development of PAM was in June 1988. So much has happened in those 25 years. Apart from all of us getting 25 years older, the growth in technology on farm has been amazing. The power of computers, the birth of the internet and email, precision farming technologies, thanks to the amazing GPS technologies ... handheld devices (Palm to PocketPC to Smartphones) ... Fairport has been there for the whole journey. Many of you have been there for the entire trip. We thank you for the loyalty. Winetech 2013 – We’ll be there! If you’re coming to the Winetech 2013 Expo in Sydney (Darling Harbour) – July 15 -17 – please drop in and visit us on stand 4820. Check out PocketPAM2, GrapeForecaster & PAM AusVit. But there’s only 12% more arable land available globally ! Farmers will need to increase food production dramatically … and with less fresh water. So… 70% of the increase in food supply must come from efficiency improving technology. We had better get busy! The Fairport Data Exchange has been under development for over 6 months and is soon to go ‘live’. We have been testing it in-house for the past month and making more improvements. For more information, please visit the PocketPAM2 web page. Almost every week, PocketPAM2 users receive a special PocketPAM2 Newsletter with news of new features. Yesterday we commenced a full rewrite of the program. Actually it’s not quite as serious as that. It is really a conversion. As we were releasing PocketPAM2 last year, the development tools we used were undergoing a full revamp to make applications faster and more user-friendly, especially for Android devices. We thought our timing was unfortunate. However, with 18 months of history now behind them, the developers of those tools now have made several enhancements and fixed a number of issues. We figure the timing is now perfect for us to make the conversion. The process is not huge. We hope no more than 2 months work. •Backup and Restore – now there are 2 complete backup & restore systems in PAM8. One to use to get PAM 7 data to PAM 8 and the new system which is much faster, for use once PAM 8 is fully set up and you have the PAM 7 data restored. •PAM – Individual Animal Records – many small enhancements added. •Plans to ‘Actuals’– currently only one actual record can be associated with a planned event. This will soon change so that many actual records can be associated back to a single plan. Many reports will be enhanced as well… to display the plan number. Colin and Roger flew to Sydney for a day f discussions with one of our larger corporate PAM Enterprise clients in early June. The result of that day will be a number of really good enhancements to the Livestock Section of PAM. Development of those should get under way very soon and we will make an announcement when it’s all done. John Deere recently updated their systems that they provide to us for our john Deere interfaces. Those are in the process of being included and will be ready for release soon. The PAM - Precision Link interface is also under development and will be ready soon. Seasons greeting to you and your families from me, the Fairport team and our families. We'd like to thank all our valued clients for the continued support throughout the year and we would like to thanks all of those who have joined the Fairport client list in the past 3 months. Yes, another year gone! Fairport's 23rd since releasing PAM 1.0 back in 1989 and never a dull moment for all those years. 2012 may have even been the busiest. After announcing the release of PocketPAM2 in our last newsletter things went crazy here. ...to all of you enthusiastic clients who came on board with PocketPAM2. Thanks especially to Murray Hall, Brookton, W.A. for the weeks and weeks and weeks of in-office then in-field testing that he put in .... Murray and I worked from early morning until the late hours of almost every day, 7 days a week for 5-6 weeks (or was it more ... memory fails me). Murray's efforts were invaluable in getting the software to the point where we could release it. He now has 3 Android devices, 1 iPhone and a Panasonic Toughbook running the software and tells me he typically gets 2 PAM diary screen fulls of data being added every day! Murray runs a pretty big show and has mentioned that PocketPAM2 will be worth 10's of thousands of dollars to their operation, by freeing up hours and hours of office time. The number of you who have call up and ordered additional licenses after a week or 2 is a further indication to us that it's working well. Some people have had a few teething problems and we have been on the case, adding features and making improvements to the "user experience" as fast as we can. As those of you with Androids know, we have had a few goes at improving the Android Back Button functionality. One client has just told me today that he believes PocketPAM2 handling of the Android back button is now the best of any App he has used. It's nice to get feedback like that ! I mentioned in the last newsletter that we had secured a new client in China - a 2500 acre vineyard operation not far from Beijing. We have enjoyed getting them up and running with PAM UltraVit. We were able to manage all the installation and training over the Internet. While on the subject of new frontiers, since the last newsletter we have a new PAM Enterprise client in Ethiopia and yet another PAM client in Sudan. We are also looking forward to several new PAM Enterprise clients in Europe coming onboard early in the new year. The hard work of our overseas agents is paying off. As you will see in the newsletter below, we have a few things in the pipeline. In the past couple of years we have been right at the cutting edge of new technologies on a few of our projects. It comes with its frustrations and steep learning curves but it is also a nice feeling to know that you can't be more 'up to date'. More below. Over the last few months I have been to Queensland twice and South Australia. I was in Queensland, Emerald (Goonoo Station) training up the Farm Managers (Will, Chris, Sian & Jodie) for AACo on the use of PAM for their cotton operations and Toowoomba training up Matthew from Mort & Co. I also had a meeting with Prime Ag about the ongoing use of PAM in their operations. In South Australia I was talking to one of our PAM clients that wants to move up to the next level to help manage their ever growing Potato & Olive operations. Apart from that I have been very busy with presentations of PAM Enterprise to various large Agricultural operations across Australia, Europe, USA and South America. It is amazing to see how things have picked up worldwide in the last 6 months now everyone is over (or had enough of) the GFC. There are huge investments being made into Agriculture worldwide and in many cases the investors are foreign to the country they are investing in. The flow on effect is also beneficial to the “normal” farmer because the R & D investment by these operations enable companies like us to develop & improve our products that in turn become available to everyone. Having done so many presentations I will be doing a trip to Europe early next year to start rolling out some of these sites which will be using some of the new PAM Applications that are mentioned in this Newsletter, so it will be very exciting. Looking forward to reporting on the rollout next Newsletter. All the best to you and your farming operations for 2013. Many of you will have already 'met' our new IT Support man, Manuel Louis Silva Castilla. Manuel has been in Australia for a few years after immigrating from Columbia with a Bachelor's degree in IT. He topped that up with a Master's Degree at Curtin University here in Perth. Not only has he taken the strain of technical support from the other team members, he is also writing small applications and last but by no means least, he is communicating with our South American clients, prospects and agents. Max Bank, a graduate of computer science from Germany who has joined us, just this week. Max is on a working holiday in Australia and tells us he's a bit "over" picking fruit. He is fitting in well and enjoying working in his chosen field for the first time since graduating. We have thrown Max in 'at the deep end' after he demonstrated some talent with web based application programming! Mikhail Beloshapkin, our mapping (and lots of other things) developer, has once again returned home to Russia for his annual leave. In the past few weeks the temperature has plunged to as low as (minus) 47 degrees Celsius in Novosibirsk where Mik is from! The weather has been unusually cold this year for this side of February. One of Mik's favourite winter pastimes in Russia is ice fishing. That is, cutting a hole in the ice cap that forms over the river Ob and throwing a line in. There should be no shortage of ice. In the September newsletter we announced the arrival of Kaye, our new accounts lady. Unfortunately Kaye felt she was unable to cope with the job and left after only 4 weeks. Emily is now managing the job as well as attending university. PAM-PrecisionLink is a data entry application designed to be embedded on your tractor's field computer (console). Based on the PocketPAM2 Crop Diary and Inventory modules but including some additional features. At user definable intervals (for example, each minute, every five minutes) PAM-PrecisionLink will send back messages via 3G to your PAM computer or server. The messages will include the location of the tractor and what it has been applying since the last message (i.e. how many hectares covered, how much seed and fertilizer applied). If you aren't set up with 3G or WiFi from your tractor, there will be an option to move the data back to your PAM computer with a USB drive. And ... You will be able to watch on your office computer screen as the tractor(s) move around the paddocks. We have already set up a collaborative arrangement with one on-board-device supplier to embed PAM-PrecisionLink on their on board devices for a large farming and irrigation project overseas in the first quarter of 2013. Stay tuned, we'll be making more announcements on this in early 2013. Please Note: This is a replacement for "DES" which we developed in 2002 for entering PAM records while running on KEE and Farmscan consoles. DES is no longer being released or supported. Also in 2013 we will be releasing the PAM-FieldRex application. PAM-FieldRex will be the FieldRex module from PocketPAM2 plus the gpsScout module. For clients with one or more PocketPAM2 licenses, this new "App" will be available free ($0.00) and is designed for your agronomists to use for paddock recommendations when on your farm. PAM FieldRex has the same functionality as the FieldRex module in PocketPAM2 and the Paddock Recommendations section of PAM itself. Your consultants can send their recommendations back to PAM when they have completed a scouting mission. Then they can simply tap on the "toPAM" button and send those recommendations back to PAM. The recommendation can be seen in PAM, can be sent to a PocketPAM2 or PAM PrecisionLink operator in the field. And then ... you can convert the recommendation into an actual event or into a planned event. As you do that process you can edit it if something needs changing. Seamless integration between PAM, PocketPAM2, PAM FieldRex and PAM PrecisionLink. PAM FieldRex can also prepare a concise version of a recommendation which can be emailed or SMS'd directly from the smartphone - Either iPhone or Android. Since our last newsletter we have added some nice features to PAM. New layout for the Planned Event Worksheet in the Paddock Activities Diary. The new layout is shared across all event types and includes facilities for better tracking of machinery hours. Thanks to our clients (Macquarie) in Brazil for this enhancement! In PAM 8 we have changed the way the paddock & cropped area pick lists work. When you plant a crop in a paddock, if you plant the entire arable area, the uncropped areas list will no longer list that paddock. If you plant less than the entire arable area the un-cropped areas list will list the paddock, but only the uncropped portion is available for recording jobs against. So, when you have completed the harvesting of the winter crop in these paddocks and if you then want to plant a summer crop in one or more the same paddocks, you need to tell PAM that the winter crop is finished. On the Add Wizard in the PAM Paddock Activities Diary or Paddock Season Screen, click on the “Cropped Areas” tab and you will find a new button “Set Cropped Areas Status” ... click on this button to show a special form where you can make each of the cropped areas non-current. There are instructions on the top of the screen explaining how it works. "I've been waiting for this for years"
"This new App will save me and my employees a huge amount of time each month... Thanks Fairport"
The App is now available from the iTines App Store, Google Play, and for Windows Tablets, from the Fairport Web Site. Please read all about PocketPAM2, how to get it, how to install it, how to get it talking to PAM and all things related to PocketPAM2, please visit our web site. Look out for the "Getting Started" page... look for "the 6 easy steps". A long time has passed since our last newsletter, apologies for that. We'd like to thank all our valued clients who continue to keep us busy with requests for new and better software and we would like to thanks all of those who have joined the Fairport client list this year. The past 9 months has had us extremely busy as we prepared for the roll out of PockPAM2 and PAM8. Also in this period we have moved office. After 15 years based in South Perth we decided to move away from the city centre into the outer Perth suburbs to make commuting easier. As the companies affiliated with the mining industry compete for office space nearer the city, rents were climbing at a crazy rate. Now we're located in a quiet, almost rural area in the suburb of Spearwood. We completed our move here in mid March and are well settled in now. Fairport continues to support Nuffield Australia Farming Scholars. We were very happy to have helped in the sponsorship of David Gooden from Lockhart NSW to attend the 61st Worshipful Company of Farmers Agricultural Business Management Course in Cirencester, UK in February this year. David wrote to us on his return to elaborate on the benefits of the course. We wish David every success for the future. I had a good catch-up with a number of old Nuffield Scholars here in Perth recently. Earlier this year Colin married his partner, Allison and they took a trip through South America for their honeymoon. Colin took the opportunity to visit some of our clients in Argentina. He also caught up with our representative in Argentina while in Mendoza. See more below. Interest in our PAM Enterprise version has been on the increase in recent months from local agri-businesses as well as plenty of interest from overseas. We are talking with large operations as far afield as Russia, the United Arab Emirates and China. Read about our move into China below. Now that we have PocketPAM2 released, we will be moving more and more software to mobile devices over the coming months. Stay tuned. Our office administrator, Emily started studying at university at the beginning of the second semester this year. We have now appointed Kaye Anderson to fill that role. Kaye will be your first point of contact when you call Fairport. Kaye was originally from Victoria where she and her husband ran a painting and decorating business. Kaye has had her fair share of farming experience having worked on fruit farms in Victoria and Queensland. Emily has moved to a part time role here in supporting Colin and Roger with technical and marketing roles. We have been filling our ad hoc programming needs by outsourcing via the internet. We have a great team of people we now call on as and when needed. Colin was in South America during April on holidays and spent time in Chile and Argentina. While there he visited one of our Clients, Trapiche in Mendoza who have about 3000 hectares of vineyard spread across several areas of Argentina. Colin had a training session on Grape Forecaster and PAM UltraVit with members of the Viticultural Team (luckily most of them spoke very good English!!). Marcelo (vit manager) said that Grape forecaster was a very important tool for their operation as they buy grapes on the open market as well as growing their own so the winery has a very good indication as to what tonnages need to be purchased well before harvest. Colin said it was really good to meet the people he had only been corresponding through email for so many years. Colin also met with Pablo Minatelli from Bodega Norton one of the original vineyards in the Mendoza region and also in the top 5 exporters of wine from Argentina. Colin showed Pablo through the PAM UltraVit Software and Precision Data Processor. Norton has committed to do a 12 month trial using PAM UltraVit (in Spanish) they have been looking for software like PAM for some time, to centralise all their data that is collected on the vineyard. After a few months of discussion, Vincent and our new friends at ZT Vineyards in China have come aboard as our first clients in China. ZT Vineyards is a 2500 acre viticultural operation located near Beijing comprising 5 separate vineyard management offices and several wineries. We look forward to getting to know the workings of the operation better over the coming years.